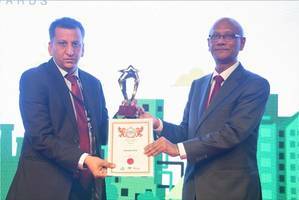 *Developer Group *received India’s Most Ethical Companies (Real Estate) Award at The World CSR Congress, the establishment that recognise the positive role of organisations where ethics, compliance and good governance are translated into action. The award was presented by Hon’ble *Mr*. *N.I Nahid*, Minister for Education of Bangladesh. The fact that Developer Group is India’s first 100% Japanese corporates’ promoted Real Estate Company, serves as a root cause for the highest degree of transparency and earnestness maintained throughout each and every operation of the Organisation. Integration of the Japanese ethos clubbed with the Indian value system forms the backbone of the Organisation. As a Company that bases everything on ethics, Developer Group aspires to lead by example and shall embark on changing the way the construction and development industry operates. This is not only good for the customers but also great for the industry and the nation. There are many reasons that have helped Developer Group win this prestigious award - the group operations entail regular stringent audits involving the leading audit firms, completely and fully legal transactions across the Company display the strong commitment to rules and laws of the nation. Not only are the corporate regulatory compliances of the Company in perfect order, they shine through by attaining 100% project specific regulatory and legal compliances as well. However, what makes Developer Group stand out is its commitment to the environment. Every project in the portfolio reflects their green initiative and incorporates new and innovative technologies to give back to the environment. Developer Group is committed to bringing in new practices and new ways of thinking in an industry that impacts the lives of millions and shapes the way society evolves. At the cornerstone of this vision are professionalism, transparency, ethics and reliability. Currently, the company has two residential projects under development at Visakhapatnam & near Bengaluru and plans to launch four projects in the National Capital Region, Mumbai Metropolitan Region, Chennai and Ludhiana in the near future. To know more about Developer Group, visit: http://www.developergroup.com/.